Assisi, the Basilica of San Francesco and Other Franciscan Sites is an eclectic site that was inscribed on 5 cultural criteria. It got praised as an authentic Umbrian hill town, a sanctuary, for its art and architecture in the Basilica of San Francesco, and for the influence of the Franciscan order in the world. The town, already a sanctuary in Roman times, has been associated with Saint Francis since the 13th century; Assisi was his birthplace, and he founded the Franciscan religious order here in 1208. The area is also a cultural landscape, with its Hellenistic and Roman road systems and medieval pilgrimage routes. The designated area also includes four Franciscan sites outside central Assisi: Le Carceri, San Damiano, Rivotorto and Santa Maria degli Angeli. 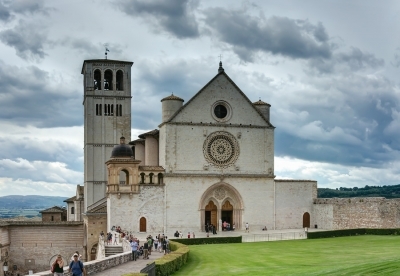 The Basilica of Assisi was badly damaged by an earthquake that happened September 26, 1997. Part of the vault collapsed, killing four people inside the church and carrying with it a fresco by Cimabue. Assisi also has been built on a hill, the Asio. At its top lies the Rocca Maggiore fortress, below the town of about 25,000 inhabitants. All buildings are constructied in the same style and with the use of limestone. This is really the busiest place so far on my journey. Besides Italian day trippers, there are also buses full of schoolchildren, Polish and Chinese. Are they tourists or pilgrims? Assisi is a pilgrimage site because of Saint Francis. This poor little man founded a brotherhood focused on poverty, simplicity and charity. Nuns and monks are a common sight on the streets (clothed in gray, black and brown). But there are also plenty of souvenir shops to satisfy the tourist category. I start my visit at the Santa Chiara Church. It is named after Clara, the companion of Francis. The ceiling of this church is completely painted with frescoes. Also there are wooden crosses with images of Christ. In the very colorful crypt below stands her tomb. There are also relics to see of Clara (clothing and hair). In the center of Assisi is the Piazza del Commune, the central square. It houses the Temple of Minerva from the 1st century BC. This was a Roman temple, but since the 13th century has become a church too. On the other side of the square is the town hall (Palazzo del Podesta) with frescoes on the ceiling over its gateway. I finish my round at the St. Francis Basilica. It dates from 1253. It is a huge construction built on a rocky point on the edge of the city. Actually, there are two church buildings on top of each other. 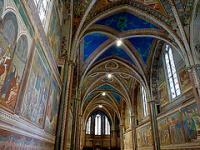 The upper church is light and large, filled with medieval frescoes on the life of Francis by famous Italian painters like Giotto. The lower church is dark but has also had its walls painted almost completely. The simple stone tomb of St. Francis stands in a crypt below the lower church. The atmosphere here is very serene and dark. There are believers who kneel to pray. The simplicity of this grave fits his life and views, but is in sharp contrast with the pomp and circumstance that is built around it. Francis probably has therefore already turned around in this grave many times. -as independent traveller accommodated close to Santa Maria degli Angeli for 3 days. It was sufficient to visit (almost) all important franciscan sites in/around Assisi: (1) Basilica di S Maria degli Angeli (huge 16th-century basilica with original church of Porziuncola inside - an important place in life and death of S Francesco), (2) City of Assisi with the Basilica of S Francesco (amazing church with three parts - described in detail by others), There are many important historical monuments within the city walls as described by others, I would emhasize the facade of cathedral S Rufino (important masterpiece of Umbrian romanesque style, interesting to compare with facade of Duomo in Spoleto), (3) S Damiano outside city walls (very quiet place, also important in life of S Francesco), (4) Eremo di Carceri (located in the area of Mt Subasio, it takes some effort to climb the mountain but one can feel Franciscan spirituality there), (5) Santuario di Rivotorto - I have not visited it, but it is not far from Santa Maria degli Angeli by public transport. It is another place where early franciscan comunity lived for certain time, before moving to Porziuncola. -as pilgrim walking from Santuario La Verna in Verna Mountains close to Bibbiena (Arezzo) to Assisi. This place has nice setting on steep hill with breathtaking views surrounded by beech forests. La Verna is another important place in life of S Francesco (stigmata). However, La Verna is not part of WHS despite its importance. There is a marked trail (yellow T - tau) from La Verna to Assisi, it takes ca. one week, and it is well-maintained, so, do not afraid to be lost even without pretty expensive official guidebook of Camino di San Francesco. In conclusion, this site is very important in my life. I visited Assisi in the summer of 2014. At that point, the town easily vaulted towards the top of my personal list of the most impressive day-trip destinations, having hosted us for half of a day. The town’s World Heritage inscription is centered on its sacred architecture, but it is also incredibly picturesque and, pilgrimages aside, does not convey a feeling of being overrun with tourists. Although there are plenty of crafts, souvenir, and local specialty shops, Assisi does not feel overly commercialized either. There is a number of fairly interesting museums sprinkled around the town, all seemingly not requiring any fee to enter. 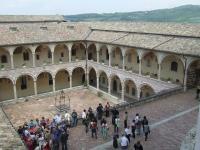 But the pilgrims and most of the tourists come to Assisi for its religious monuments. Basilica of St. Francis, the monumental church honoring the most famous local son is a magnificent architectural masterpiece. It is actually two basilicas in one. The lower basilica, with un-church-like low ceilings, is covered all over in brilliant frescoes and paintings. The upper basilica, more traditional in form, is also vibrantly decorated. I have seen my share of spectacular cathedrals but San Francesco is a species apart, in my experience. We also visited the other major churches named in the UNESCO inscription, Santa Chiara, San Ruffino, Santa Maria sopra Minerva. Each one has something to impress with and warrants a look, but they pale in comparison to San Francesco. Beyond that, we simply leisurely strolled through the town. Its terrace-based hillside plan makes it less compact than other destinations of comparable stature and requires a bit of walking to get from one end of town to another. There are not many true squares, but Piazza del Comune is spacious and lively. Various corners of the town provide many delighful visual highlights. We only made cursory acquaintance with museums and arts and crafts establishments. 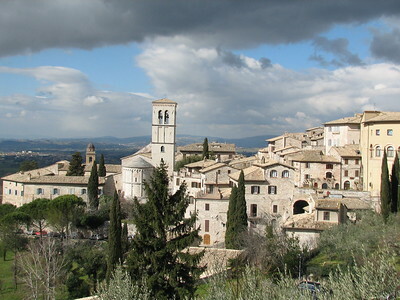 Assisi can easily support a full day or even a day and a half with all that it has to offer. Its location in Umbria rather than, say, Tuscany keeps it away from most-traveled tourist routes, but if you have even a few hours to spare for a detour, I highly recommend visiting Assisi. I visited this WHS in August 2013. Compared to what I've read I was surprised that I was one of the few tourists around (perhaps most were afraid of the scorching sun?). I was expecting many crowds but this was not the case. Assisi is a tranquil place with a beautiful cathedral (which is sort of divided in 2 floors). The cathedral interior on both floors is wonderful and the restoration works on Cimabue's and Giotto's frescoes which took place after the 1997 earthquake are simply incredibly perfect. The train arrives at the village of Santa Maria dei Angeli, from where buses run to various points around Assisi. I alighted at Piazza Matteotti, the highest point, and close to the cathedral of San Rufino. Not an outstanding edifice with its austere exterior and drab interior. From there I walked down to the Basilica of Santa Clara, a more interesting building, but plainly decorated inside. My favourite however is the small church of Santa Maria of Minerva. The ornate altapiece is spectacular. After passing through the town I descended to the Basilica of San Francisco. The frescoes here are amazing, and it was clear from the crowds here that most visitors never get to go beyond this building. My last stop was the Abbey of St Peter's Monastery, an interestingly shaped building, before going to the bus stop in the Piazza dell'Unita d'Italia to catch a bus back to the station. I made this visit on a day out from Rome. Assisi is a pretty touristy place, but justifiably so. 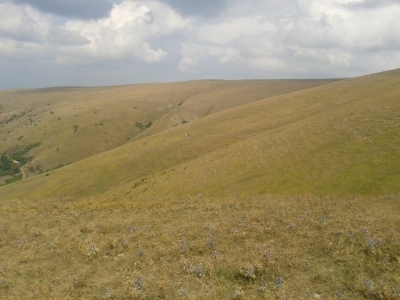 The location on a hill is just amazing (especially coming from the west, i.e. Perugia), and the town itself is beautiful despite the crowds. Assisi is of course dominated by the Franciscan Order and its many churches, monasteries, and other structures, chief among them the huge Basilica of San Francesco on the edge of town, looking almost like a castle. Scattered on the outskirts of the town are nice places like the San Damiano Monastery, and the small town of Santa Maria degli Angeli with yet another very impressive church (after which, by the way, Los Angeles is named) is very close, too. An interesting place to visit, not only for pilgrims and monks. Ceramic tile was being removed from the floor in a large room in a building near the St. Francis’ Basilica. The workmen happily insisted we take a full piece of tile as a memento of Assisi. It’s right beside Jim’s computer, used every day as a coaster. But surprise of all surprises, there was a two-story, canopy covered escalator, leading up the hill from the parking lot. At the top of the escalator we walked higher through the town, then turned and walked down, down and down the hill, snaking through this most unusual city. Fruit and vegetable vendors filled market squares, pink stone houses and stores lined the narrow walkways. In spite of what we missed by not parking near the Basilica, parking in that upper lot, riding the escalator up the hill, then walking those miles down the hill through Assisi, was one of the best travel ideas we ever had even if it was just an accident. Religious Relics: At Santa Chiara: "Against the back wall of the crypt are some holy relics, including tunics worn by Francis and Clare, a shirt she embroidered, and some locks of hair Francis sheared from her head." Reduced from broader TWHS: TWHS originally included the work of Fra Angelico in Cortona. 254 Community Members have visited.